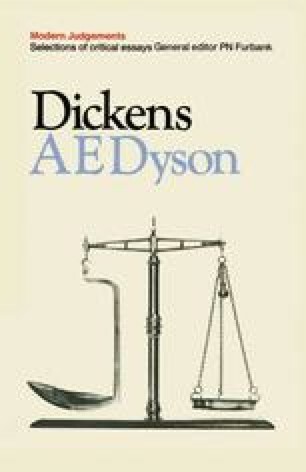 Dickens has often been likened to a Jacobean dramatist both for his vivid, exuberant, ‘poetic’ use of language and for his methods of characterization. There is a third point of likeness. Critics frequently discuss Jacobean plays in terms of ‘episodic intensification’. By this they mean the impulse to exploit to the full possibilities of any particular scene, situation or action without too much regard for the relevance of such local intensities to the total work of art. Clearly much of Dickens’s fiction is of the same order. To admit this is to risk the displeasure of much modern criticism of fiction which, largely deriving from James, lays great stress on the organic unity of the novel and demands that no part shall be allowed autonomy if this threatens the integrity of the whole.